Seeme & Liz > Parenting Tips (0-2 year olds) > How Does Play Support Language Development? Naturally of course! Dramatic play is the best form of play for language skill building, however all forms of play will support language development. Keep in mind that you are your child’s best teacher so by being involved in her playtime (not always, they do need space to explore on their own) you can help her language skills develop. Did you know that having good oral language skills is essential for a child to be successful at school? It really doesn’t matter if he can count to ten or recite his ABC’s if he has difficulty coming up with novel sentences. Academic skills can be learned after the foundations have been set! And these foundations, including speech and language skills can and should be learned through play! One thing I want to point out is that language development is more than just saying words or sentences. Language development encompasses skills such as problem solving, critical thinking, cause and effect, spatial concepts, etc. Here are a few ways to stimulate some stellar language skills just by playing! 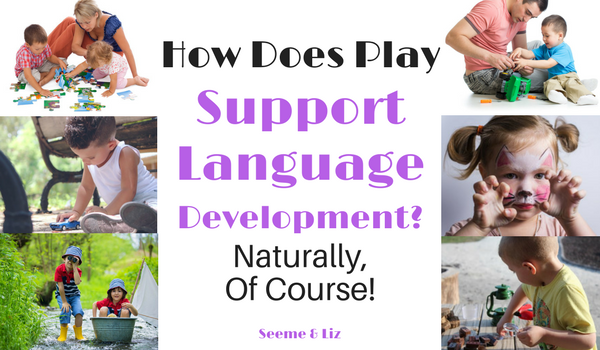 How Does Play Support Language Development? At this stage play is all about sensory exploration. Everything is new to a baby, including her senses. She is hearing, touching, tasting, smelling and seeing things for the first time. Offer your baby simple and safe objects and toys that can be explored using a variety of senses. This is playtime for a baby. If you give him a rattle, watch as he figures out that it can make noise when he moves it up and down. Take this time to label some of the things you see. For example “Look at your rattle, it’s so______”, “there you go, you are shaking the rattle”, etc. When your baby is “playing” with a toy, label the toy – give it a name. Also talk about what your baby is doing with the toy. For babies, it is important to keep toys as basic as possible. There is no need for anything fancy. Especially if it claims it will turn your baby into a genius. So throw away the talking toys and flashcards and keep it simple. In fact, even a Tupperware container will do! Babies also love social games such as peekaboo, tickles, bouncing up and down on a parents knee, etc. While playing these kinds of games talk a lot. Use motherese to keep your baby engaged. Use sounds to facilitate back and forth turn taking. For example, look at your little one intently and say “babababa”, pause and wait to see if he will respond by either smiling, vocalizing or imitating your sounds. Check out these great toys for babies (and I share many speech and language tips with each toy). Toddlers love getting into everything. If you have one you know what I am talking about. But their curiosity and need for exploration leads to some great play time, which in turn will help with the development of language. If your toddler is interested in something and you go along with that, there is a much better chance that she will stay engaged and be interested in what you have to say about the topic. As a result there will also be more opportunities for language development. Let’s take blocks as an example. If your child wants to play with the blocks, sit beside him and play with some blocks too. Watch what he does with his blocks and imitate him. You might get a few laughs. Be sure to label what is going on. Because you have followed his lead, he will listen to what you have to say. If you are building a tower you could say “I’m putting the block on, your turn. You put a block on”. In this simple scenario your toddler is learning the spatial concept of “on”. Or maybe he would prefer to hide a block “under” something or put it “in” a box. You do not have to do any explicit teaching. Keep the interactions as natural as possible. Turn taking is an important part of language development as it is what makes up conversations. If one person does all the talking, the other communicative partner will get bored and tune out. This is quite advanced for young children and the most primitive form of turn taking starts during play. While playing with your child take turns during an activity. If we go back to the blocks example, your child could add a block to the tower and then you could say “now it’s my turn” and then you add a block. As children get older, turn taking becomes important not only in carrying on a conversation, but it more organized games as well. This is a very important skill that starts to develop just after birth! I won’t list all of the toys here as I have several articles dedicated to toys for toddlers. But as I said above in the baby section, keep toys simple. Much more learning and playing can be done with toys that do not require batteries. Check out these great toys for toddlers. Again, each toy will have some speech and language suggestions. Preschoolers really start getting into dramatic play. They have had a few years to build some foundations through simple play and have learned many skills. But the play doesn’t end there. Now it becomes fun, imaginative and often based on something the child(ren) has experienced. This is why playing “house” is so common during the preschool years. But don’t take playing house for granted. And get involved from time to time. Your child may want you to take on the role of the family pet though. Offer open ended toys and play scenarios such as a play kitchen and accessories, dolls and accessories, cars, trucks, pop up tents, storage containers, blocks, etc. If you are playing with your child, listen to what he is saying. For example, if he says “I’m the baby so I get the small bed” you could say “that’s right, that bed is tiny, perfect for a baby”. Did you notice I changed the word “small” to “tiny” and added some more words? This is a great way to introduce new vocabulary through play. f you and your child are playing “airport”, for example, and she says “I drived the plane really fast” you could say “that’s right, you flew the plane so fast, it scared me a bit”. Notice I corrected the word “drived” with “flew” and then added an emotion. Now this opens the door to talk about things that might scare her or you. Don’t feel that you need to be involved in your child’s play all the time. Not only is this not feasible but children also learn many important skills through unstructured child led play (with no adult involvement). But, it is also important that you engage your child in play from time to time, and when you do, you give yourself 100% to his play time. You will need to find a balance that works for you and your family. Parental involvement in play is especially important in a child’s first 3-4 years of life as there is so much to be learned and discovered. By joining in on their play you can help come up with new play possibilities as well as be a good language model by helping them learn new vocabulary, social skills and problem solving. Remember, language development happens by interacting with others. Unfortunately (or fortunately, depending on how you look at it) there is no app or TV program that will build a child’s language skills. 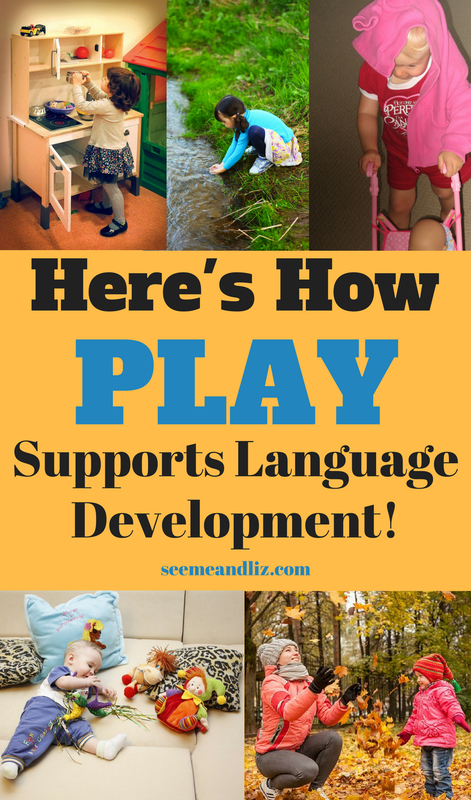 I hope I have helped to show you that YES, play does support language development! Every child needs to be given the gift of play. Both child led and adult guided forms are necessary for learning to occur. Great advice to young mothers today, I am a grandmother and talking to my grandchildren has been a habit from the day they come home from the hospital. My son would say to me why are you talking to him he is a baby? Do you really think he is going to answer you? I said no but how do you think you learned to talk? This is advice all parents need in raising their children today being so very busy with schedules for work and socializing. I would get on the floor and play with my boys and still do today with the grandchildren, we make blanket tents to color in, have tea parties, and so much more. Thanks for bringing this important lesson to light for all. Your grandkids are very lucky to have you in their lives Susan! It sounds like you are wonderful with them! Hopefully you get to spend a lot of time with them. They will remember those memories! Perhaps you should show this article to your son so he can see how language develops and why it is so important to start interacting with your child from birth! Great read. I have a ten month old and surrounded by all his toys he prefers to play with the wrapper his baby biscuit was in lol. I like a lot of the ideas in this article. What age or part of development do you implement this technique? Thanks Kelly! Babies and toddlers definitely like boxes and wrapping paper more than the toy inside most of the time! 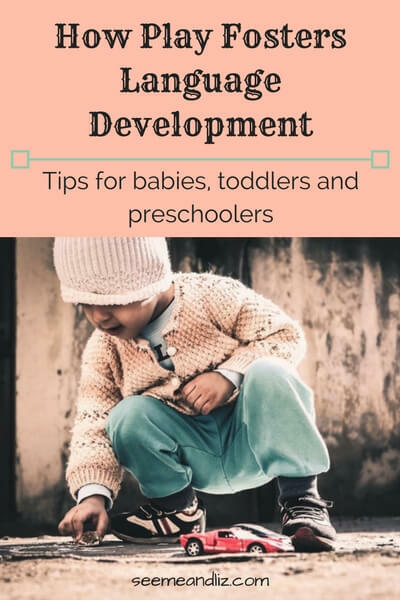 In the article I broke down what parents can do at each stage of development from babies, toddlers to preschoolers. If you still have any questions, please let me know. Should parents teach their children phonics (or reinforce it if they learn it in preschool/kindergarten) at home, or should they leave it all to the teachers and simply model through every day talk? I’m not sure I understand what you mean by the importance of phonics in language development. When I think of phonics I think about reading. This article deals only with spoken language. By this I mean vocabulary, grammar, sentence length, etc. If you could clarify what you mean by phonics I would be happy to try and answer. These are awesome tips! When my oldest was a baby, I talked to him all day long, describing everything I did. He talked pretty early. With my second, I wasn’t nearly as careful, but of course, he had his big brother babbling at him. Play is definitely a great way for kids to learn. I’m always amazed at how much they pick up. And then listening to them talking when you’re out of the room is amazing, too! Thanks Genesis! Describing things throughout your day to a baby/toddler is the way to go! And this can be done so easily in play as well! 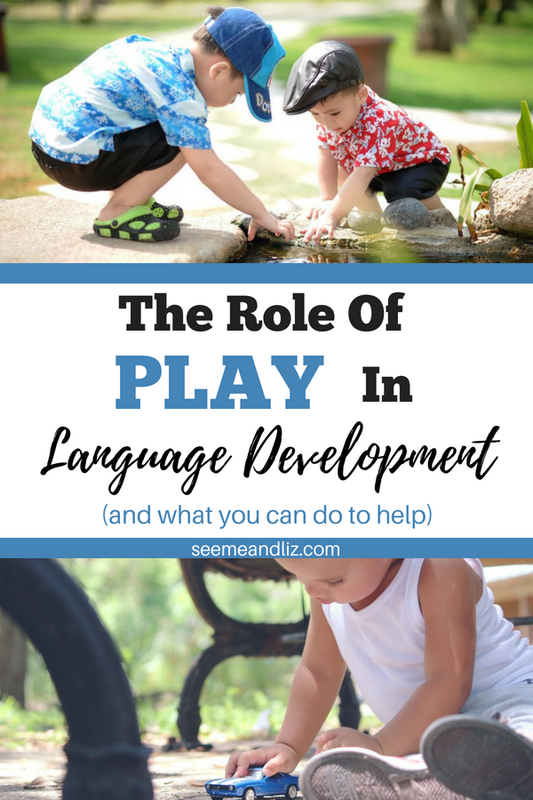 You are right about naturally developing language through play. I have found the same thing with my kids who are now grown. I have received many compliments when they were younger about their good vocabulary. I have attributed it to reading to them a lot and talking to them in correct grammar. I liked your example of the child using incorrect grammar in play and you correcting it just in the way you answered without having to point anything out. Nice article. Thanks for your comment! Glad to hear that your children were lucky enough to learn through play! By doing this you allowed them to naturally gain many valuable skills. What a wonderful site! I am an educator, and you have covered a very important topic. I am a huge fan of “Children learn Through Play.” You will find some who don’t agree with this philosophy; everyone is entitled to his own opinion; however, I feel play is a very important aspect of language development. As a toddler, my son had some language development issues; part of his therapy was to play with his Legos. We used to make up all kinds of stories with his Lego people, and they went on all kinds of adventures. As a result, his language developed while we played. A win-win situation! Hi Kathy. Thanks for your comment. And of course I couldn’t agree more. A lot of research is being done about the importance of play in a child’s development. I think this is great and will hopefully help those who feel that play is unnecessary think about it differently! I’m glad to hear your son’s therapist encouraged language skill building through play!